On 30th April 2018, the Nigerian Copyright Commission (NCC) suspended the licence of music collecting society, Copyright Society of Nigeria (COSON) stating that the suspension was consequent upon COSON’s “continued failure and/or refusal” to comply with NCC’s earlier issued directive. The NCC had directed COSON not to give effect to the resolutions taken at COSON’s meeting of 19 December 2017 except the resolution on distribution of royalties to members. 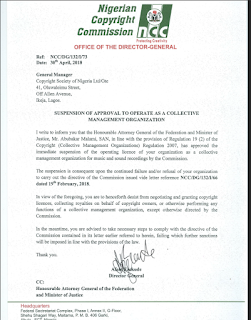 This suspension comes on the heels of Afroleopa’s views expressed in this IPKat guest post on the infighting at COSON and the powers of the NCC as sector regulator. As Afroleopa had opined, the powers of the NCC in relation to the issues at stake regarding COSON include the power to suspend the licence of a collecting society by virtue of the CMO Regulations. It is no longer news that despite these directives from the NCC, Mr Tony Okoroji (the purportedly reinstated COSON Chairman) had gone ahead to conduct an Annual General Meeting of COSON on 10th May 2018 and contrary to the NCC’s directive, ratified the resolutions reached at the meeting of 19th December 2017. In the circumstances, COSON’s governance challenges show no sign of abating. However, while it is expected that the suspension will move COSON to regroup and take the necessary steps to put its affairs in order for the benefit of its members who are right-holders, it is pertinent to note the suspension of COSON’s operating licence may not be the panacea to its problems. For one, COSON is the exclusive assignee of performing rights assigned to it by its members. In essence, COSON is the monopoly publisher of the performing right in Nigeria. As the Nigerian member of the International Confederation of Authors and Composers Societies (CISAC), pursuant to its Matrix User Tools Agreements, COSON remains the owner of the world’s performing rights in Nigeria. Its membership of CISAC guarantees it access to the CIS-Net database (a network of database for sharing works metadata) as well as monopoly control in Nigeria to issue all of the requisite qualifiers and identifiers such as International Standard Musical Work Code (ISWC), the Tune Code, the Interested Party Name Number (IPN#) and the Interested Parties Information system (IPI), which inter alia forms the basis for determining authorship and ownership of musical works and literary works (where songs have words) and by extension, accrued royalties and members entitled to such royalties. CISAC does not require its members to be accredited by their national sector regulator. Corollary to the foregoing, COSON’s suspension may not have the desired impact in its operations. Ironically, COSON’s crusade against the MCSN may have succeeded in procuring judicial precedent that may help the Tony Okoroji-led COSON. Nigerian courts have held in several decided cases that an exclusive assignee of copyrights do not require collecting society license in order to enforce such rights. That said; the NCC’s directive regarding COSON’s bank accounts might achieve the desired results if the NCC is able to procure a freeze on COSON’s bank accounts such that the current COSON Board can no longer incur expenses until the dispute is resolved. IP blogger, Victor Nzomo has indicated that he is conducting research into the best way for African countries to tackle CMOs’ governance issues and the form such regulations may take. Afroleopa opines that such research agenda should inform CMO regulations all over Africa and the rest of the world.